The opioid epidemic is growing more deadly even for the youngest members of the population, as WXXI's Brett Dahlberg reports. The rate of opioid deaths for children from birth to 19 years old had started to drop after 2008, but fentanyl has caused another increase, said Julie Gaither, an instructor at the Yale School of Medicine and the lead author of a study published Friday in the journal Pediatrics. The death toll of the nationwide opioid epidemic is still highest among men between 25 and 45, but new research suggests it’s growing increasingly deadly for the youngest members of the population — including infants. Julie Gaither is an instructor at the Yale School of Medicine and the lead author of a study published Friday in the journal Pediatrics. She’s been studying the opioid epidemic for the better part of a decade, but even she was caught off guard when she saw her numbers. The rate of opioid deaths for children from birth to 19 years old has almost tripled since 1999. Gaither said the same synthetic opioid — fentanyl — is largely responsible for the spike in both pediatric overdose deaths and the geriatric deaths that WXXI News explored in October. “The epidemic is just evolving rapidly, and in ways that no one has been able to predict,” Gaither said. 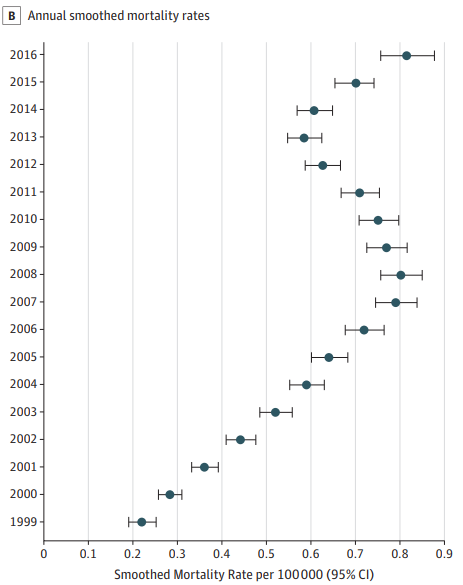 More than 600 children died of an opioid overdose before their fifth birthday in the 17 years of national data Gaither examined — and the yearly rate has grown steadily, increasing more than 200 percent since 1999. But the overall rate of pediatric overdoses slowed and even started to drop after 2008, when federal guidelines for prescribing opioids got stricter, Gaither said. The introduction of fentanyl a couple of years ago turned that all around, she said. In Monroe County, the rate of nonfatal overdoses among people age 19 and younger has also accelerated, from 1 in 2015 when the county started tracking the numbers, to 16 so far in 2018, according to data from the county's Crime Analysis Center. Fatal overdoses in that age group have not exceeded more than two in a year, though. Gaither laid a hefty part of the blame for the national death toll on drug manufacturers and sellers. “There are still opioids that don’t come in child-proof packaging — or even child-resistant packaging,” she said. Gaither also said doctors should be more explicit in warning patients about the dangers of keeping opioids in the house. She said around the country, the most common official place to dispose of unused prescription opioids is at police stations, but that’s not often well-advertised. In Monroe County, there are six medication drop boxes, all operated by law enforcement, but three of the six counties surrounding Monroe — Orleans, Livingston and Wayne — don’t have any drop-off sites available, according to the state health department. A list of medication drop boxes in Monroe County is here. Genesee County sites are listed here, Ontario County’s site is here, and Wyoming County’s site is here.